There are many benefits to creating a schedule. You can get a real idea of how long it takes to accomplish tasks, better manage your time and scale back on how much you have to plan for the week. Here are some ways to help you manage your time better. If you tend to do the same set of steps every day, track how long it takes you to complete these tasks on average. You can be more realistic when it comes to making your schedule for the day. You can also make sure to block out an appropriate amount of time to complete projects. This can also allow you to be more accurate when creating your pricing structure as well as plotting out a proposed timeline that maps out when you will complete a job. You might have to make some adjustments along the way but there are many benefits to doing this. You can feel more in control of your time, have a better understanding of how long it really takes to finish your work and you can give a more accurate estimate to a client regarding how long something will take to finish. For example, if you’re a graphic designer who specializes in logos, time how long it takes you to complete a simple design. Do this for a week or so to get an average. So if someone asks for something more complicated, you’ll already know to add more time on to the project and charge accordingly. Once you get a handle on how long it takes you to complete certain types of projects, look at what you need to accomplish for the week and block out the appropriate amount of time to get things done. In one of my last articles, I mentioned using a free day planner just to get started. Since I write on a regular basis and it’s already a part of my daily routine, I don’t have to even bother writing it on my to do list. The schedule serves as a template for my week with some white space in between to fit in other types of random tasks that come up. Writing doesn’t even hit my to do list, it’s just a part of my schedule. I already know that I will write every week for X amount of hours. I put it on my schedule and block out ample time to complete it. It not only tells me what I’m going to be doing at the time, it shows me how much time I have left to realistically complete other tasks. It makes it easier to say no to other things when my schedule is already visibly full. If you tend to do the same type of work at the same time of day, a routine can help your day run smoother and take some of the decision making out of figuring out what to do each day at what time. 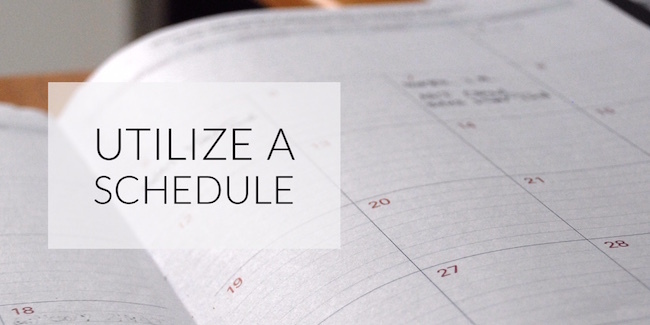 You can even purposely schedule calls or other appointments before this blocked out time period so you don’t have to constantly rearrange your schedule. Structure your week this way as best you can and things will flow better. You might be thrown a curve ball every once in awhile and you might have to restructure things a bit but making a schedule is a true time saver. When you have a series of tasks you do regularly, there’s no real need to waste time writing them down on a to do list week after week. Stick with a routine to structure your time on a regular basis.